Following Scotland’s recent independence referendum, I felt overcome with envy. How I wished I could have a referendum too. I want to discuss who runs my future. I want the right to decide. I clearly am not the only one to feel this way, and I expect more referendums of this kind in the future. Catalonia — which my firm, Independent Diplomat, has advised — seems set to have some kind of vote on Nov. 9, despite fervent opposition from Madrid, and its attempt won’t be the last. The hunger for self-determination is rife across Europe. Self-determination is about more than wanting your own country, though. During the run-up to the Scottish referendum, many commentators characterized this trend as resurgent nationalism, but I am not sure that’s the right term. While there were sometimes nationalist overtones and downright racism in the pro-independence yes campaign, it was striking that non-Scottish residents, not just native Scots, were permitted to vote. Meanwhile, nonresident Scots by blood were not allowed to vote. The pro-independence vision of a future Scotland was multi-cultural, bound into the shared sovereignty and open borders of the EU. Surveys showed that most Yes voters wanted more local decision-making; they were much less interested in assertion of a more atavistic Scottish “identity.” In Catalonia, where hundreds of thousands have demonstrated for independence, it’s a similar story. Unlike the nationalisms of the 20th century, this is not about blood and which race owns the territory. Rather, it is about control. This brings up a deeper concern. The Scottish pro-independence campaign was driven by motives that are widespread well beyond Scotland’s borders. It is not only Scots who resent distant elites making decisions without their participation: Many Americans feel exactly the same way. And it is not only Scots who want to reverse the seemingly inexorable deepening of inequality and the rapacious depredations of modern capitalism, both to the environment and society. Almost everyone, except perhaps the large corporations and the wealthy individuals who benefit from the current dispensation, feels disenfranchised. This is a collective crisis of agency. Alex Salmond, the pro-independence Scottish first minister who resigned after the vote, claimed during the campaign that an independent Scotland would remedy these ills simply by governing the country better. But this is the promise of every political party: In their hands, they say, things will be better. But without changing the fundamental architecture of democracy and the economic system, they won’t. Whatever the flag and whatever the political party in charge, conditions won’t change without deeper structural changes in the forms of democracy and the economy, from top down to bottom up. Run-of-the-mill politicians or political parties won’t be the ones to make these essential reforms. To understand the shortcomings of politics as usual, look to France. There, a socialist government came to power two years ago with similar promises of social justice, environmental protection and better government. These undertakings today seem empty: President François Hollande enjoys the lowest popularity ratings of any postwar French leader. Just a few days ago, the far right National Front won its first seats in the French Senate: Polls suggest that its leader would win a presidential election if it were held today. Hollande’s “reformist” government failed primarily because it was unable to withstand the pressures from international investors and the global markets to water down plans for employment protection and the minimum wage. French bond prices and credit ratings collapsed, interest rates rose, investment dried up, and unemployment rates stayed high. Hollande was forced to reverse course, destroying his credibility in the process. He was defeated not by his painful lack of charisma but by the structural forces of capitalism. Yet another old boy of ENA, France’s school for the governing elite, he has also proved woefully unable to connect to a disenchanted, angry populace and thereby opened the door to the populist National Front, a party more truly redolent of the ugly nationalism of the 20th century variety. France has demonstrated that traditional political strategies cannot fix the problem and may risk a slide into extremism. Top-down policies to address inequality and a fracturing society will be undermined by global economic competition, which forces governments to race to the bottom in minimizing employment protection and corporate taxes. Witness the Irish government’s craven attempts to bribe Apple and other large multinationals to locate in Ireland by offering massive tax breaks. An independent Scotland would have faced precisely the same pressures, compounded by uncertainties over its currency and arguments with Britain over who owns the North Sea’s oil. Something more fundamental is needed. Democracy has been subverted, and it must be returned to the people. The putative contract between the state and its people is that government should provide security and prosperity in return for obeying the state’s rules (putative because it is never stated and I, for one, don’t remember signing it). A lot of people in Scotland and beyond feel their politicians are not delivering on their side of this deal. Prosperity is reserved for a few, while everyone else has seen sharp declines in wealth and their long-term financial prospects. If the Earth itself is threatened, there is no security. Politics is dominated by a sharp-suited professional clique that talks in overrehearsed banalities while presiding over a political and economic disaster. It’s no wonder people are disillusioned, especially the young, who see a future of perpetual debt and environmental catastrophe. A few nudges on the policy tiller won’t do. Democracy has been subverted, and it must be returned to the people. In ancient Athens, every citizen took part in decision-making (although, granted, only free male adults could be citizens). Today such mass participatory democracy has produced better, less corrupt government and more equality in cities like Porto Alegre in Brazil (as shown by this World Bank study). When thousands of citizens decided the budget, provision of city services, like education and sanitation, increased dramatically and were more evenly distributed across poor neighborhoods as well as rich ones. The city is at the cutting edge in developing progressive recycling and renewable energy projects. The participatory process is overwhelmingly supported by the city’s population. It has also, reportedly, changed the tenor of the city’s politics, with less partisanship and more common endeavor. Everything is transparent, from decision-making to contracting, dramatically reducing corruption. Critics of such mass democracy often allege that ordinary people are incapable of running complicated entities like cities or countries. But Porto Alegre’s and other participatory processes around the world show that, on the contrary, ordinary people are better than professional politicians detached from quotidian realities. Just as turkeys will never vote for Thanksgiving, no professional politician will propose reforms that give away their power. There is a certain naiveté in believing that merely one vote, whether in a general election or independence referendum, will change things so fundamental. 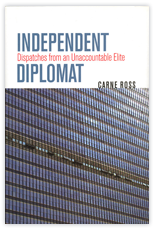 Meaningful democratic reforms — in dictatorships and monarchies as well as in Western countries inaccurately referred to as democracies — will take time; they must be built and learned from the bottom up. These are cultural and personal changes, from a defeatist and, frankly, lazy belief that nothing can be changed to a more enlightened commitment to cooperation and shared responsibility. It will take work. It can be tedious to participate in decisions about your city. (I’ve tried it in Occupy Wall Street meetings and in New York City neighborhoods.) It is annoying to tolerate differing views at the workplace. But these are practices that can be learned and continually refined. Nothing human can be perfect, but ingenuity and patience will, with commitment, prevail. The Scottish vote was over a modern conception of self-determination. But in earlier times, self-determination meant a more personal liberation: being free to live as one wished, with people more in control. Today this libertarian ideal must be combined with the truth that only together through peaceful, just and democratic collaboration can humanity prosper and survive the many perils it now faces. This is the kind of self-determination that everyone wants. So far, it has been tragically denied. Old-fashioned nationalism of blood and soil can never deliver the freedom and agency so many of us yearn for today. But perhaps the frustration and hunger revealed in Scotland’s passionate referendum and, we can predict, in other places will help stimulate this urgent debate and deliver a necessary revolution. 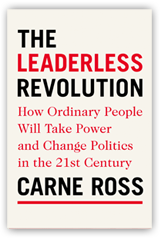 Carne Ross is a former British diplomat and the author of “The Leaderless Revolution: How Ordinary People Will Take Power and Change Politics in the 21st Century” (Penguin).